This seems a potentially costly proposal. compensation for loss of life. There were plenty of empty spaces in both city centre car parks and park and rides. We have submitted our comments on the revised Flood Risk Assessment (FRA) submitted by the Applicant, Oxford City Council, as part of its application to extend Seacourt Park and Ride into the floodplain north of the Botley Road, Oxford. It seems that this is being proposed as a panic response to a perceived lack of parking for the new city-centre Westgate development – that development has been known about for years and this application is evidence of a failure to plan properly for it. We are opposed to this application on flood risk grounds and do not believe that the FRA gives a proper assessment of the risks. The application is contrary to national planning advice and if allowed would set a most serious precedent nationally. Despite being asked, the Applicant has failed to supply a single example of where a similar development has been allowed, in Flood Zone 3(b) – the floodplain proper, elsewhere. There are risks of both groundwater and river (fluvial) flooding of this particularly low-lying site. We are not satisfied that the development, in the floodplain, would not increase risk elsewhere. It would put vehicles, and more importantly people, at risk during flood events: in a very big flood the water could be 2 metres deep and flowing fast. Washed away cars could block the nearby river (whether this is the existing channel or the proposed Oxford Flood Alleviation Scheme channel) and bridge, preventing water getting away from the Botley Road area and making flooding there worse. The car park is likely to be particularly expensive to build as the ground is inherently unstable and will almost certainly need special ‘lime stabilisation’. It would be unusable during floods and require protracted pumping out and clean up afterwards – expensive in itself and losing revenue while the car park was closed. It’s our view that the need for for this extension has not been demonstrated, nor the economic case made. It could easily prove a costly white elephant, an embarrassment to the Council, an extra expense on a already strained public purse, and a risk to public safety. 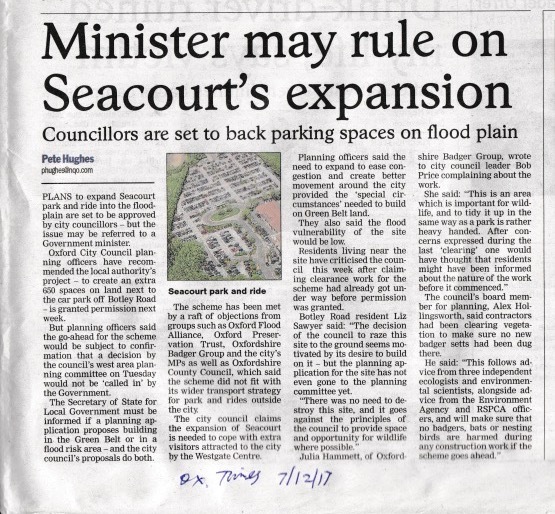 Oxford is subject to regular and damaging flooding – its floodplain should never be a place for a car park. For its own City Council to be proposing such a thing is hard to understand. When this was first proposed the same Council was simultaneously proposing to remove a large number of spaces at Redbridge P&R a mere 3 miles away – whether that is still the case we do not know but it does rather suggest a lack of co-ordinated planning. We hope Oxford City councillors will see that this idea is a disaster in the making and show their good sense in abandoning it. Our own recent objection is also here as a pdf.